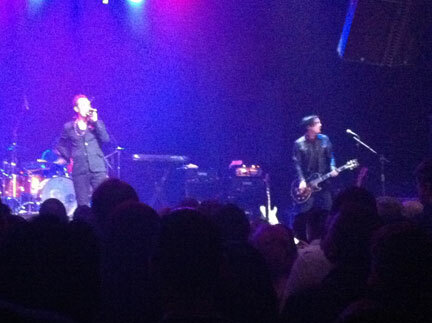 Earlier this year I caught Peter Murphy at the Mayan here in Los Angeles. It was the first time I had ever been to that venue. It was also the first time I had ever caught Peter Murphy solo. As a long time fan of Bauhaus et al., it was never in the cards for me to see Peter Murphy solo before. Despite the self deprecating jokes throughout the set, he still puts on a great show. I would have to say I actually enjoyed it more than any of the Bauhaus reunion shows I’ve attended. As a special treat for those in attendance, he honored a special request for a newly married couple and played a song you don’t hear any many (any?) other solo sets on this tour, Bauhaus’ All We Ever Wanted Was Everything. I’ve included that as the sample below. Wow! “All We Ever Wanted..” has always been one of my all-time favorites! Great post. I am looking forward to seeing the thin white duke here on the right coast in November. After hearing this, I will make sure I do not miss it. By the way, the new album, Ninth is great. I really dig it….sort of a Cascade type vibe.